Florida Governor Rick Scott gives an update to the media regarding Hurricane Irma on September 6, 2017 in Doral, Florida. WASHINGTON - When there is a crisis in Florida there is always one thing you can count on: Gov. Rick Scott in his trademark Navy hat. 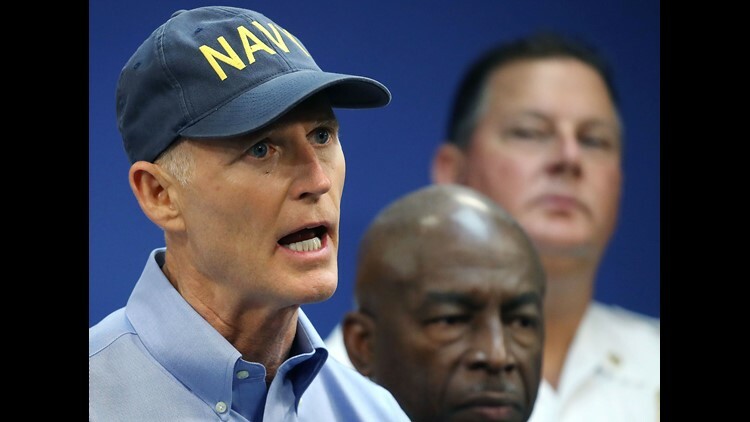 The Republican governor of Florida, who is running for Senate against incumbent Democratic Sen. Bill Nelson, always seems to have handy the dark-blue cap emblazoned with "NAVY" on the front. It's made its way to campaign events for years and graced television screens this week as millions across the nation watched Scott give updates on Hurricane Michael's devastation in the Panhandle. But now, the hat is being used as a target on Scott's record when it comes to veterans and health care. An ad by VoteVets, a left-leaning veterans group, rips the governor's former life as head of the nation's largest private hospital chain. "I see Rick Scott wearing that Navy hat everywhere he goes but let me tell you what he did to veterans," Alan Madison, a Navy veteran opens the 30-second ad. Under Scott's tenure as CEO of Columbia/HCA, the for-profit company was fined $1.7 billion for defrauding millions from Medicare, Medicaid and TRICARE, a military health care program, the company's settlement with the Justice Department states. The ad specifically targets the defrauding of the military's health care and his pleading of the Fifth Amendment during a civil case about the matter. It even includes decades-old footage from Scott being deposed under oath. More: Florida Sen. Bill Nelson: Noble career or career politician? "Today, he's worth $200 million bucks. For veterans like me, we got cheated," Madison says in the ad. Scott did serve in the Navy. He was enlisted for 29 months and ended his service as a radar technician, according to the Tampa Bay Times. Scott's campaign, in a statement, responded to the ad saying Scott was focusing on Hurricane Michael and offered comments from six veterans who support him and his record on helping veterans as governor. "As a veteran, I am disheartened to see Bill Nelson and his democrat friends play politics with our military – but their false attacks can’t distract from the truth," Gulf War veteran Kat Gates-Skipper said in a statement provided by Scott's campaign. "I have seen firsthand the numerous ways Governor Scott honors our American heroes and their families." The ad, which is slated to run for 10 days across the state, ends with a question. "Governor, this hat represents what the Navy stands for: Honor, integrity," Madison says, pointing to his dark blue Navy hat and peering into the camera. "My question for you, sir? Where's yours?"